Afsharypuor, S., Asghari, G., Mohagheghzadeh, A., Dehshahri, S. (2010). Volatile Constituents of the Seed Kernel and Leaf of Moringa peregrina (Forssk.) Fiori, Agricolt. Cultivated in Chabahar (Iran). Iranian Journal of Pharmaceutical Sciences, 6(2), 141-144. Suleiman Afsharypuor; Gholamreza Asghari; Abdolali Mohagheghzadeh; Shadab Dehshahri. "Volatile Constituents of the Seed Kernel and Leaf of Moringa peregrina (Forssk.) Fiori, Agricolt. Cultivated in Chabahar (Iran)". Iranian Journal of Pharmaceutical Sciences, 6, 2, 2010, 141-144. Afsharypuor, S., Asghari, G., Mohagheghzadeh, A., Dehshahri, S. (2010). 'Volatile Constituents of the Seed Kernel and Leaf of Moringa peregrina (Forssk.) Fiori, Agricolt. 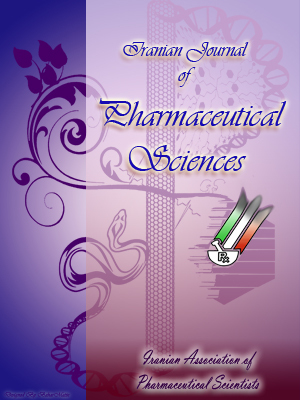 Cultivated in Chabahar (Iran)', Iranian Journal of Pharmaceutical Sciences, 6(2), pp. 141-144. Afsharypuor, S., Asghari, G., Mohagheghzadeh, A., Dehshahri, S. Volatile Constituents of the Seed Kernel and Leaf of Moringa peregrina (Forssk.) Fiori, Agricolt. Cultivated in Chabahar (Iran). Iranian Journal of Pharmaceutical Sciences, 2010; 6(2): 141-144. 2Department of Pharmacognosy, Faculty of Pharmacy and Pharmaceutical Sciences, Isfahan University of Medical Sciences, Isfahan, I.R. Iran. 3Department of Pharmacognosy, Faculty of Pharmacy, Shiraz University of Medical Sciences, Shiraz, I.R. Iran. Volatile constituents of the seed kernel and leaf of cultivated Moringa peregrina (Forssk.) Fiori, Agricolt collected after hydrolysis were analyzed by GC and GC/MS. Five glucosinolate degradation products which constituted almost the whole isolated oil of the seed kernel were identified to be: isobutyl isothiocyanate (94.0%), isopropyl isothiocyanate (4.9%), sec-butyl isothiocyanate (0.5%), n-butyl isothiocyanate(0.5%) and benzyl isothiocyanate (<0.1%); while the volatile isoth-iocyanates which constituted also almost the whole isolated oil of the leaf were found to be: isobutyl isothiocyanate (88.5%), isopropyl isothiocyanate (10.2%), n-butyl isothiocyanate (0.4%) and sec-butyl isothiocyanate (<0.1%). Moringa peregrina (Forssk.) Fiori. [Moringaceae] is a tree growing in Sistan and Baluchestan Province of Iran and locally called “Gas-e-rowghan” or “Gaz Rokh” [1, 2]. This tree bears 20-40 cm long seed pods, each containing 8-15 unwinged seeds . Young seeds of the plant are eaten in the way peas are eaten while mature seeds are fried or roasted like groundnuts. The seed kernel is rich in fixed oil (42-54%) with up to 23% protein. The oil is edible and is used medicinally as diuretic, rubefacient and astringent . Occurrence of few isothiocyanates in seed extracts of Moringa peregrina growing elsewhere was reported previously by other researchers . To the best of our knowledge, this is the first report of the volatile constituents of the seed kernel and leaf of M. peregrina growing in Iran. As a part of a project of phytochemical research on the abovementioned cultivated plant, the volatile constituents of the seed kernel and leaf were prepared by a distillation method and determined by gas chromatography (GC) and GC-mass spectrometry (MS). Table 1. Volatile constituents of the seed kernel and leaf of Moringa peregrina (Forssk.) Fiori, Agricolt. a: also known as 1-methyl ethyl isothiocyanate; b: also known as: 1-methylpropyl isothiocyanate; c: t = trace (< 0.1 ); d: also known as; 2-methylpropyl isothiocyanate; e: also known as palmitic acid. Seeds and leaves of M. peregrina were obtained in 2008 from The Department of Natural Resources of Chabahar city, Sistan and Baluchestan Province, Iran. Voucher specimens of the seeds and leaves (no. 2025) were deposited in the Herbarium of the Pharmacognosy Department, Faculty of Pharmacy and Pharmaceutical Sciences, Isfahan University of Medical Sciences, Isfahan, Iran. The powdered seed kernel and air-dried leaf (30 g of each) were separately mixed with distilled water (450 ml), covered by a layer of cyclohexane and left for autolysis at 25 °C overnight (17 h). Then each mixture was shaken for 5 min. and the volatile constituents were collected by distillation . The organic layer of each distillate was then concentrated under nitrogen gas and analyzed immediately. Gas chromatographic (GC) determinations were run on a Perkin Elmer 8500 instrument using a BP1 capillary column (30m×0.25 mm; film thickness: 0.25 μm). The carrier gas was nitrogen with a flow rate of 2 ml/min. The oven temperature was programmed from 60-275 °C at 4 °C/min. Injector and detector temperatures were 275 °C and 280 °C, respectively. Analysis of the volatile constituents was performed on a Hewlett Packard 6890 GC/MS instrument under the following conditions: injection of 0.1 μl samples, HP-5 MS capillary column (30 m×0.25 mm; film thickness 0.25 μm); carrier gas He, flow rate 2 ml/min, injector temperature 250 °C, temperature program: 60-275 °C at 4 °C/min. ; mass spectra: electronic impact, ionization potential 70 eV, ion source temperature 250 °C, ionization current 1000 μA, resolution 1000 and mass range 30-300. Identification of the constituents was based on computer matching against the library spectra (Library Database Wiley 275), their retention indices with reference to an n-alkane series in a temperature programmed run, interpreting their fragmentation pattern and comparison of the mass spectra with the literature data [6, 7]. The identified volatile components in two different parts of M. peregrinaas well as their relative percentages are listed in Table 1. As it is obvious, almost the whole isolated volatiles of both the seed kernel and the leaf were identified to be the isothiocyanates, which constituted 99.9% and 99.1% of the total phytochemicals, respectively. The isoth-iocyanates of the seed kernel were: isobutyl isothiocyanate (94.0%), isopropyl isothiocyanate (4.9%), sec-butyl isothiocyanate (0.5%), n-butyl isothiocyanate (0.5%) and benzyl isothiocyanate benzyl isothiocyanate ( 0.1 %) . However, Kjaer et al. who analyzed the seed oil of the same plant, which grows near Qosseir in the Red Sea coastal region of Egypt, reported the occurrence of three volatile isothio-cyanates, namely 2-propyl, 2-butyl and 2-methylpropyl isothiocyanates (which are also known as isopropyl, sec-butyl and isobutyl isothiocyanates) in the proportional amounts of 20:1:10 respectively . This means that the three above mentioned volatile isothiocyanates which were detected in the seed oil of the Egyptian plant could also be identified in the seed oil of the Iranian plant but with different proportions. Furthermore, we could also detect two more volatile isoth-iocyanates in our plant, namely n-butyl and benzyl isothiocyanates, the occurrence of which has not been reported previously in this plant. The volatile isothiocyanates which constituted also almost the whole isolated oil of the leaf were found to be: isobutyl isothiocyanate (88.5%), isopropyl isothiocyanate (10.2%), n-butyl isothiocyanate (0.4%) and sec-butyl isothiocyanate (Moringa. We are grateful to Mr. Parvaresh(Department of Natural Resources of Chabahar) for providing the seeds and leaves of the plant, Dr. Y. Ghasemi and Dr. P. Faridy (Department of Pharmacognosy, Faculty of Pharmacy, Shiraz University of Medical Sciences) for their help in analyzing some oil samples by GC/MS, Mrs. Armita Jamshidi and Mrs. Negin Mahdinezhad for their help in analyzing some other oil samples. Ghahreman A. Flora of Iran. Vol. 21. Tehran: Institute of Forests and Rangelands Publications, (2001); No. 2578. Mozaffarian V. A Dictionary of Iranian Plant Names. Tehran: Farhang Mo’aser, 1996; p. 219. Al-kahtani HA. Moringa peregrina (Al-Yassar or Al-Ban) seeds oil from Northwest Saudi Arabia. J King Saud Univ 1995; 1: 31-45. Kjaer A, Malver O, El-Menshawi B, Reisch J. Isothiocyanates in myrosinase-treated seed extracts of Moringa peregrina. Phytochemistry, 1979; 18: 1485-7. Lockwood GB, Afsharypuor S. Comparative study of the volatile aglucones of glucosinolates from in vivo and in vitro grown Descurainia Sophia and Alyssum minimum using Gas Chromatography-Mass Spectrometry. J Chromatogr 1986; 356: 438-40. Adams RP. Identification of essential oil components by gas chromatography /quadrapole mass spectroscopy. Illinois: Allured Publishing, 2004. Budzikiewicz H, Djerassi C, Williams DH. Interpretation of mass spectra of organic compounds. San Francisco: Holden-Day, 1964.